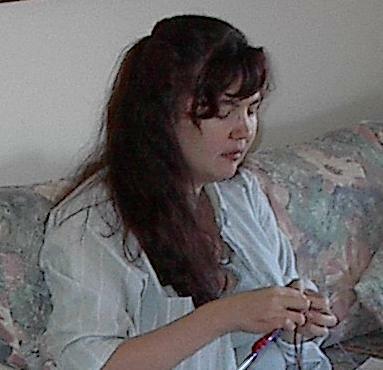 "Silver Belle" from the 25th Anniversary issue of Vogue Knitting. 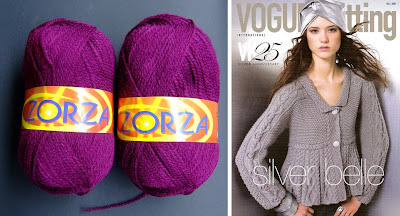 In my case, it's a Purple Belle, I bought the yarn today, it's a Polish brand called "Zorza" by Anilux, 25% wool/75% acrylic, a bit darker than the picture shows. The theme for the MS3 has been revealed today and I wish I knit this stole in white in stead of black - the theme is Swan Lake! In case you are waiting for the parasol tutorial - I"m very sorry but I didn't manage to finish it this week... Next week we are at the summer cottage, so I promise a tutorial in the week after the next one, around 15th August. I bought a lace yesterday but I still need some paint and some time to finish it. What a great choice for your next sweater-it is beautiful! And i love the color that you chose-purple is one of my favorite colors. Enjoy your dinner tonight-sounds like it will be quite a feast!! I can see why you fell in love--it's a great design! I still haven't had a chance to peruse that issue. Hopefully this weekend. I've been hoping someone would knit this, so I could watch and see how it went. It's a lovely sweater, and a very clever design. Your color is lovely too. The whole thing should be very flattering. Good luck!